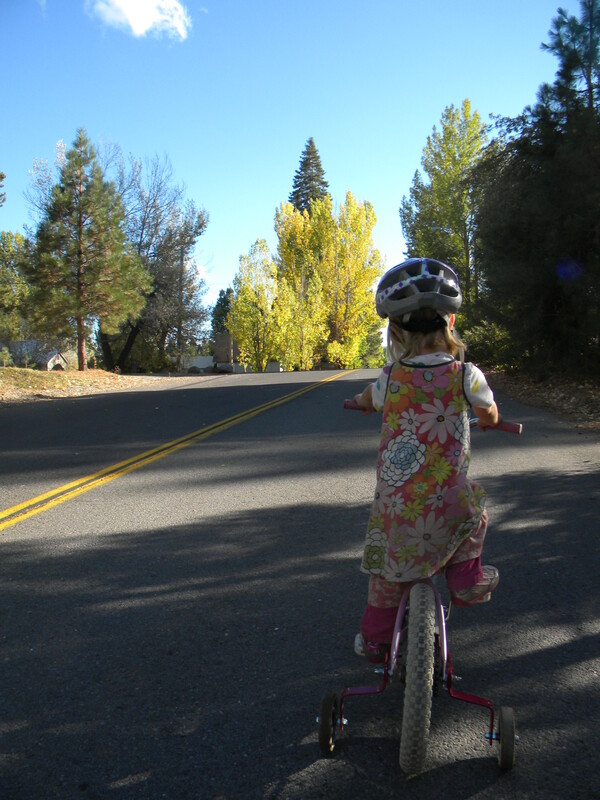 My four-year-old has spent evenings pedaling back and forth on a small bike with training wheels. This is a newly acquired skill, and she is absolutely hooked. Her normal bounds are between the apple tree to the east and the neighbor’s VW van to the west. 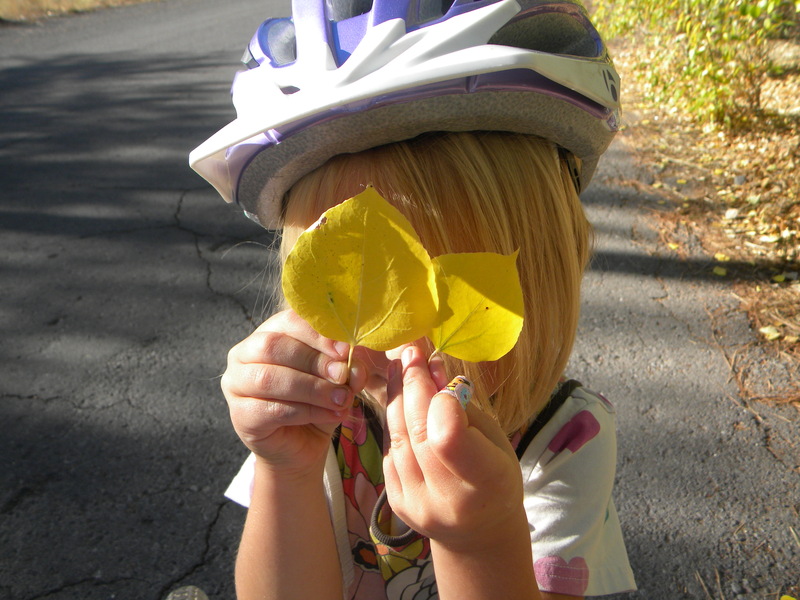 But the other evening she initiated a “Leaf Hunt” to fill the basket on her bike with fallen leaves. The aspen (Populus tremuloides) and black cottonwood (Populus balsamifera ssp. 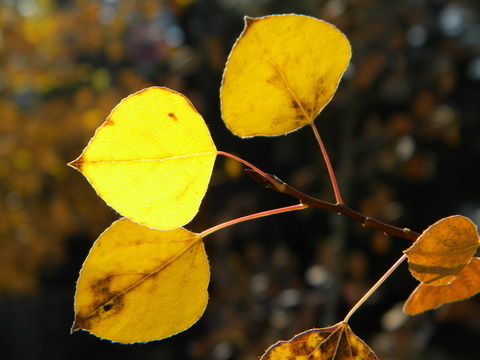 trichocarpa) are in their full fall glory now, and we biked around town in search of their bright yellow canopies. Her self-imposed parameters were very specific. 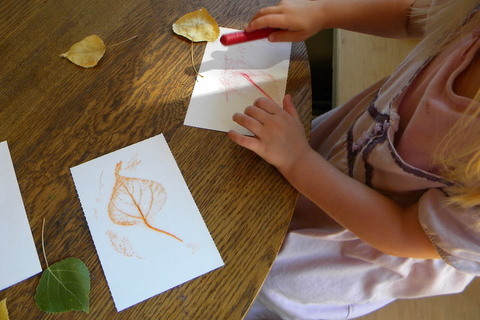 She would take only two leaves from each tree, and they must be pliable and bright yellow. 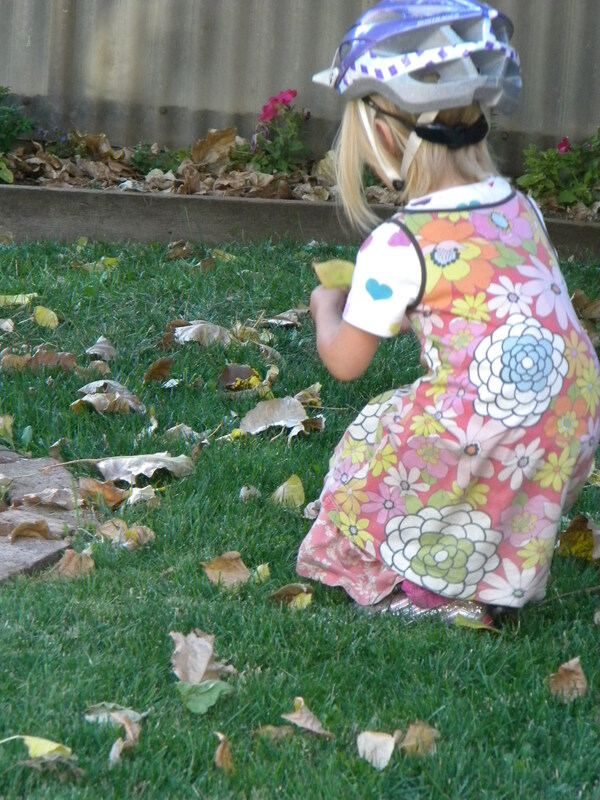 I watched as she would examine and reject multiple specimens before settling on a few chosen leaves to add to her basket. When we returned home, she arranged them in rows. So amazing to watch that natural human tendency to categorize and organize our surroundings express itself in this child’s play. 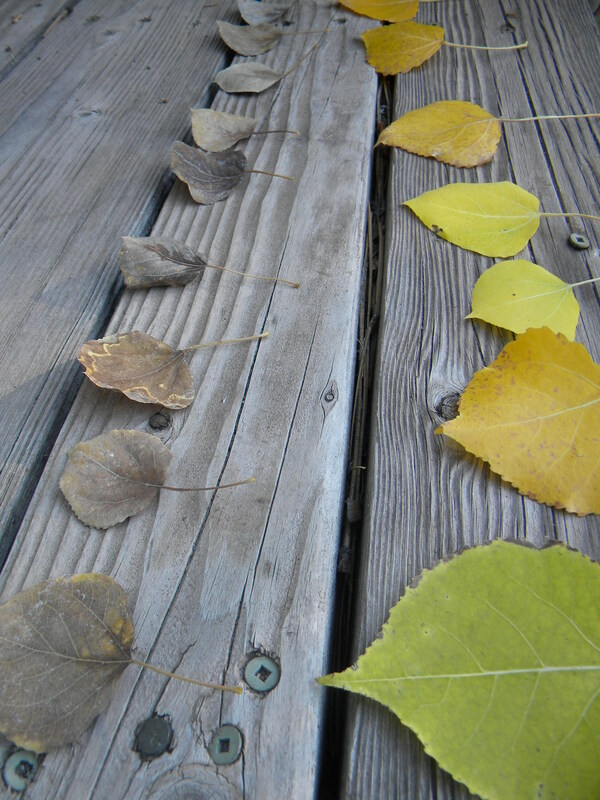 We are in the thick of fall, drinking in sunshine while we can, watching the aspen turn in the yard. 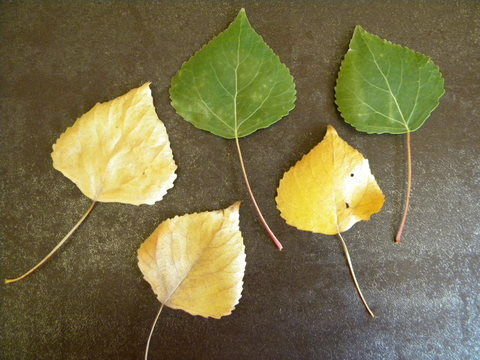 Seems like just yesterday that our aspen trees leafed out, but already they flame yellow. This yellow pigment (a carotenoid that helps to absorb light used in photosynthesis) was actually present all along, but masked by the bright green of chlorophyll in the leaves. But as days grow shorter and cooler, photosynthesis slows to a halt, and leaves become more trouble than they are worth to a deciduous tree. So chlorophyll breaks down, the plant reabsorbs any reusable sugars and nutrients into stem tissue, and the leaves abciss from the stem and drift to the ground. The aspens hunker down, as will we, reserving our energy for the coming spring. Last Tuesday night we fell asleep to the patter of rain on the metal roof, and awoke to this. Autumn’s mixed bag will return temperatures to the 70s next week, but this quick winter storm gave us a taste of days to come. M. lamented the end of summer for a bit, but as we talked of hot cocoa and snowmen; Christmas and snow caves, she warmed to the idea and ran out for her first taste of snow. 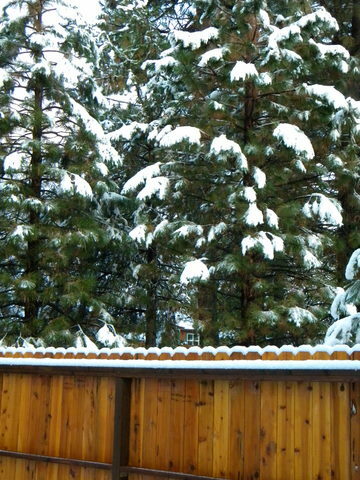 A. paused at the porch, unwilling to traverse the mysterious expanse of white before her. Our aspens were bent to the ground by the weight of heavy, wet snow. Our garden appeared to be toast. But with the return of the sun, the yard has rallied for one last hurrah before winter. Last night marked the first fire of the season. 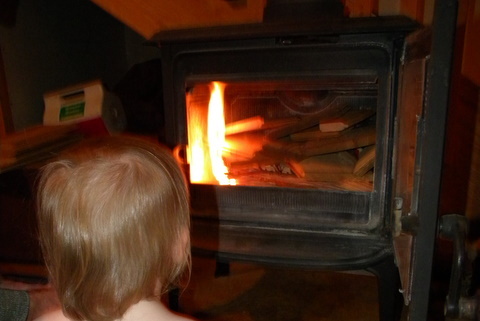 Until now our home has absorbed nightly dips into the 30s, but the damp chill of an impending storm drew us to the woodstove. 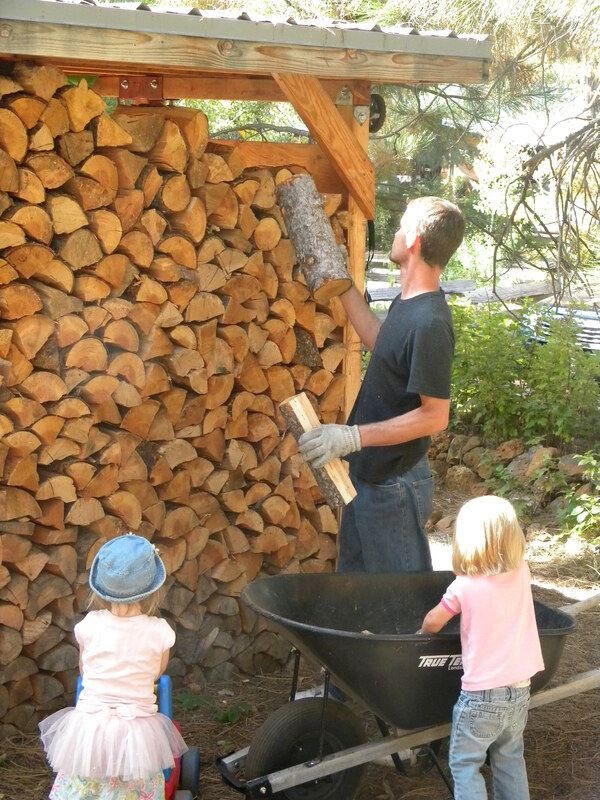 We watched as the cedar kindling caught and crackled, and a welcome warmth radiated from the hearth. My wee one was a bit feverish this morning. She is such a mover, even when sick, that I thought the best way to keep her still was to put her in a stroller and take in the advent of fall. M. took the lead on her paddle bike and we walked with friends down to the Birch Street aspen grove on Robbers Creek. A few leaves have started to turn, but most remain green. 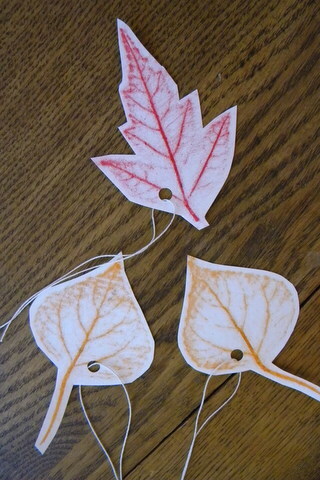 We plucked a few to take back with us, and made these leaf rubbing gift tags. 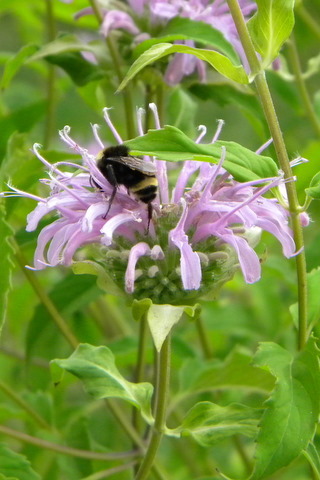 Usually our garden bee balm blooms around the 4th of July. But this year, they are in full flower now, at a time when most of our garden has gone to seed. They host scores of native bumblebees. Nothing like trying to explain the complexities of our world as a reminder of the wonder of it all! An afternoon thundershower, and the first rain in a month. We watched from the porch as atmospheric tension dispelled into thunderous echoes. Hard rain pinging off the metal roof, my husband’s hair licking into curls, moisture soaking into our parched skins and parched soils. 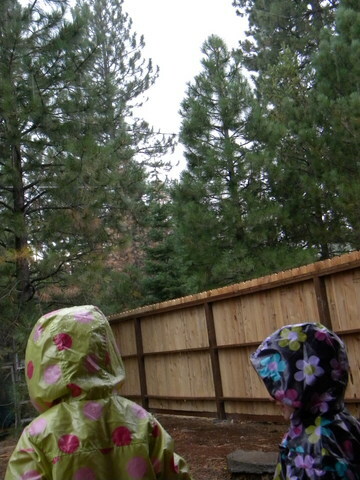 Our two little girls barefoot, in rain jackets and not a stitch more.